It's been waaaaay too long since I last caught up with Fat Slim Donkey, so we made plans to have dinner together. Neither of us have been to Jinjuu, and I thought it was about time that I checked out what the fuss was all about. I started the evening the way I often do - with a "girlie drink". 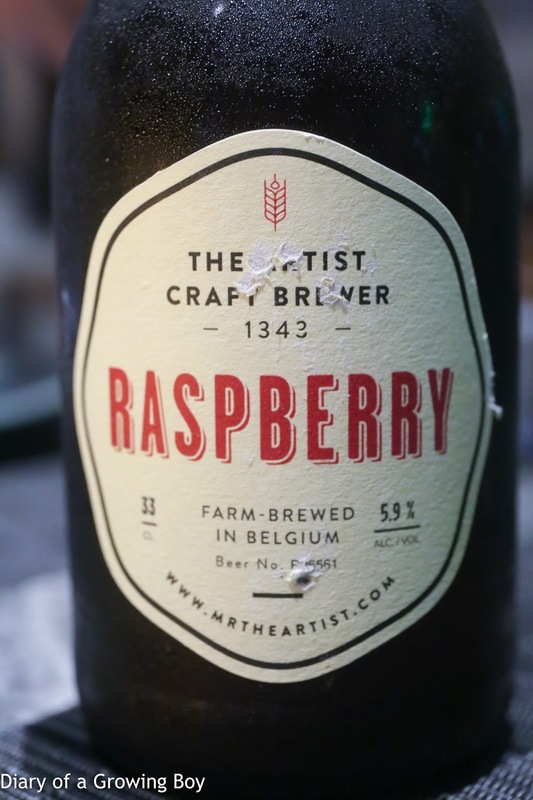 The Artist Raspberry Beer seemed like a good choice, as the sweetness would no doubt help temper the burning taste buds after some spicy food. It turned out to be really tasty - as Slim Donkey said, it's like a raspberry liqueur with a hint of beer. Very fruity, and at 5.9% alcohol, not as "girlie" as one might think. Given how small our table was, we decided it would be best to order our food in rounds. 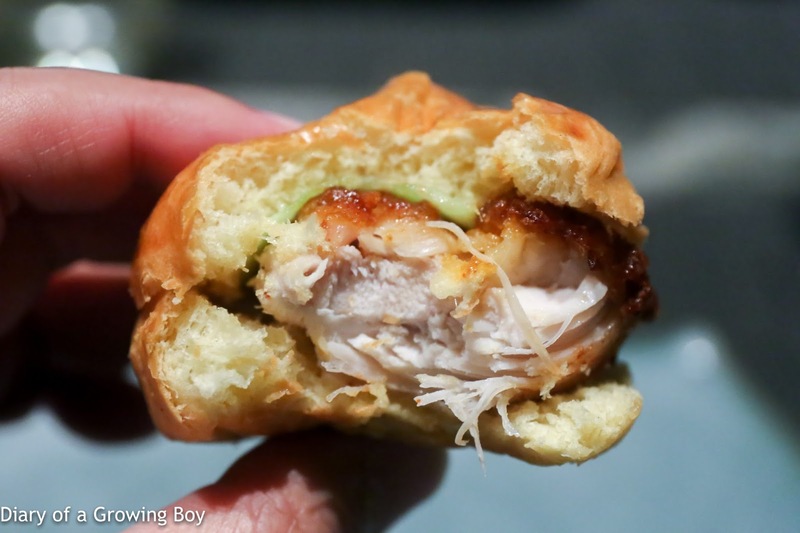 Korean fried chicken sliders - not bad, but the chicken thigh was slightly on the dry side. The seasoning was also a little underwhelming, and these definitely could have used a little more sauce. 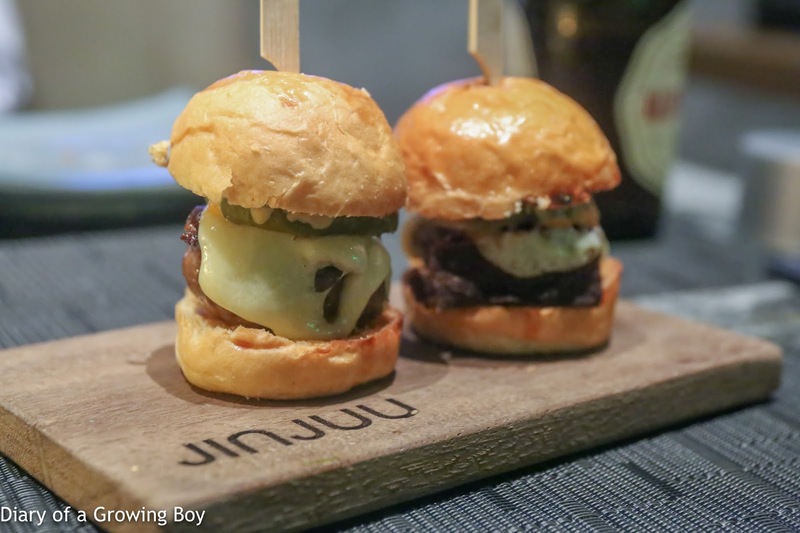 Bulgogi wagyu beef sliders - pretty decent. Bacon, kimchi, and cheddar were all there. Not much to complain about... other than the fact that these were a little "tall" in terms of height, and short of squishing them it would be a little hard to fit in one's mouth. At least, I found it somewhat difficult. 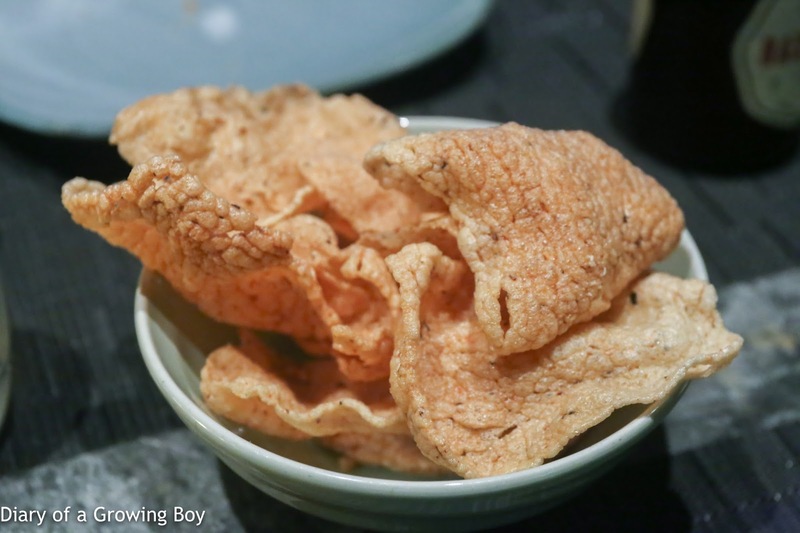 Jinjuu prawn crackers - nice little kick these have... or as Slim Donkey called them... adult prawn crackers without the sweetness. 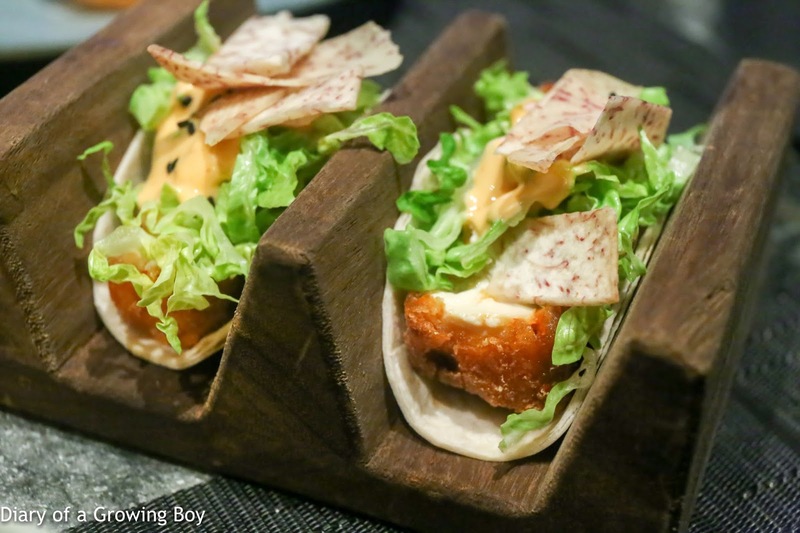 Tofu tacos - one might be fooled into thinking that these things are healthy, but make no mistake... we're talking about deep-fried tofu here. And yes, these were a little bland. No surprise there. 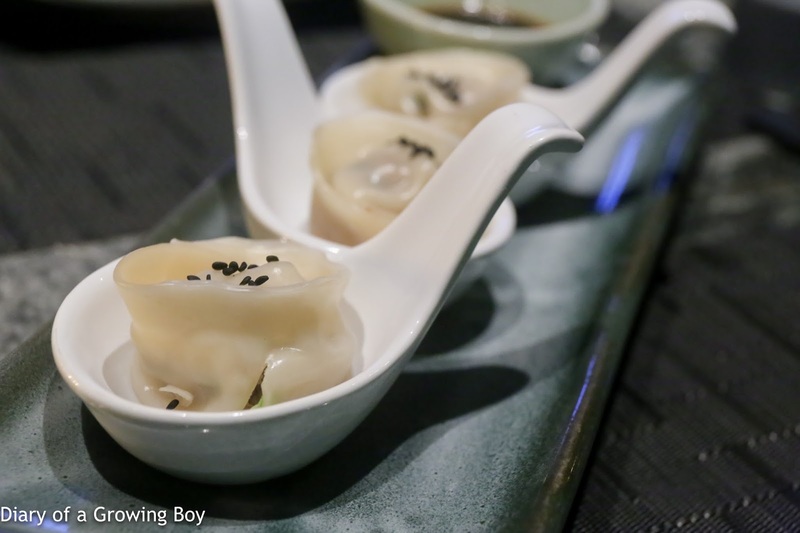 Mandoo (만두) - these beef and pork dumplings were, unfortunately, uninteresting. Aside from the wrappers which were too dry - note the big tear in the dumpling in the foreground - the filling was neither sufficient in quantity nor tasty. 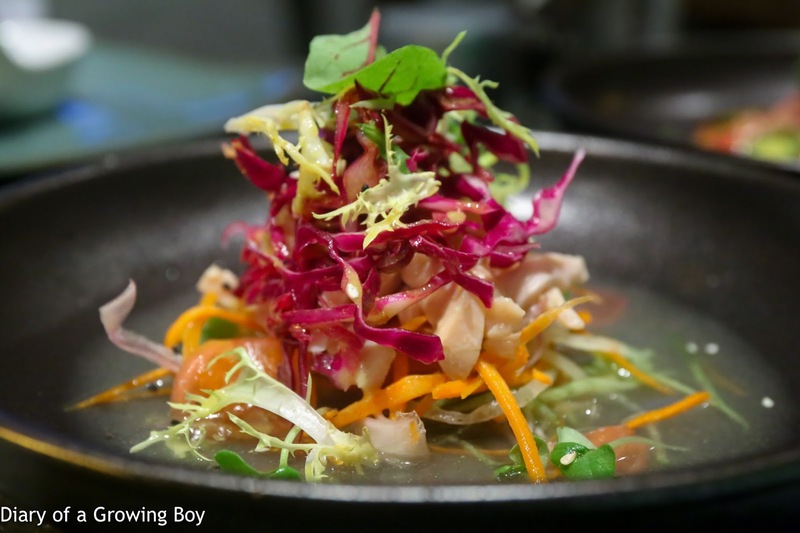 Cho gye tang salad - nice acidity from the mustard vinaigrette, and a slight kick from kimchi. The strips of Australian free-range chicken were tender and moist, but there wasn't much flavor there. Overall, though, this wasn't bad. Inspired by the cold chicken soup noodles cho gye tang (초계탕). Tuna mulhwe - the sustainable tuna was pretty decent, and I liked the spicy kick from the kimchi. 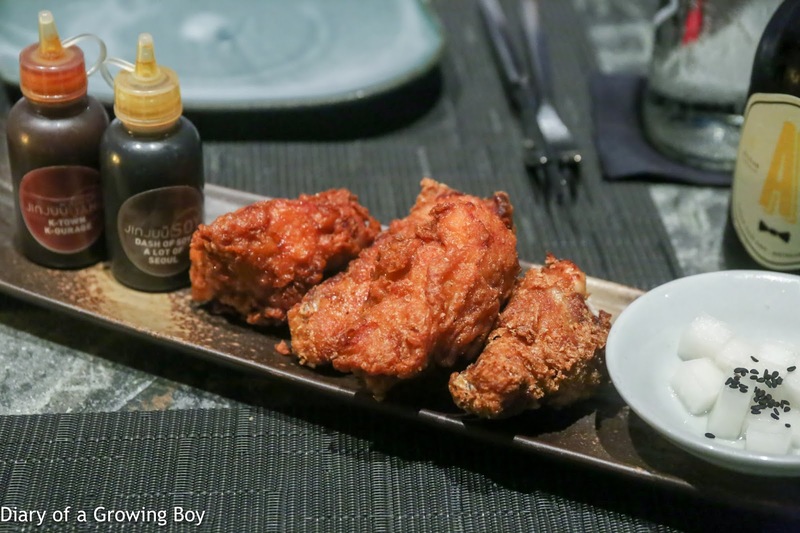 Jinjuu's signature Korean fried chicken - we asked for a mix of thighs and wings. 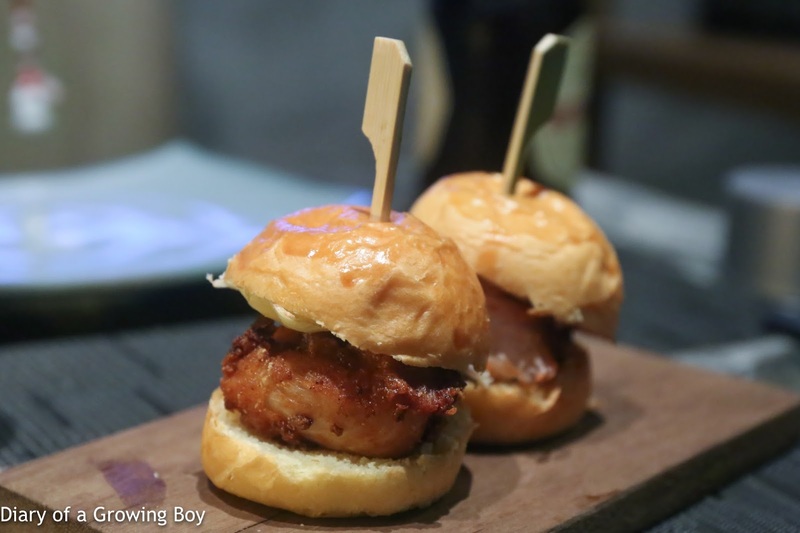 These were much better than what we found in the sliders, as the meat was very juicy. However, as much as I thought the execution was impeccable, I must admit that the chicken was very under-seasoned. It certainly needed the sauce that came on the side - I suppose it's pretty standard for Korean fried chicken to be drenched in sauce - and the spicy garlic sauce was pretty damn delicious. The pickled radish on the side had rather sharp, stinging acidity. 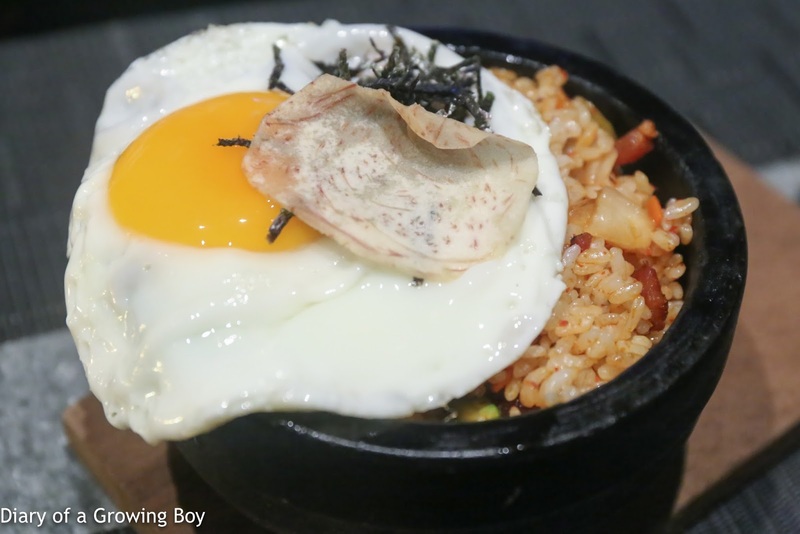 Kimchi fried rice - our waitress tried to sell us on the bibimbap (비빔밥) instead, but I was already very full and thought this would be sufficient to do the trick. And I was right. 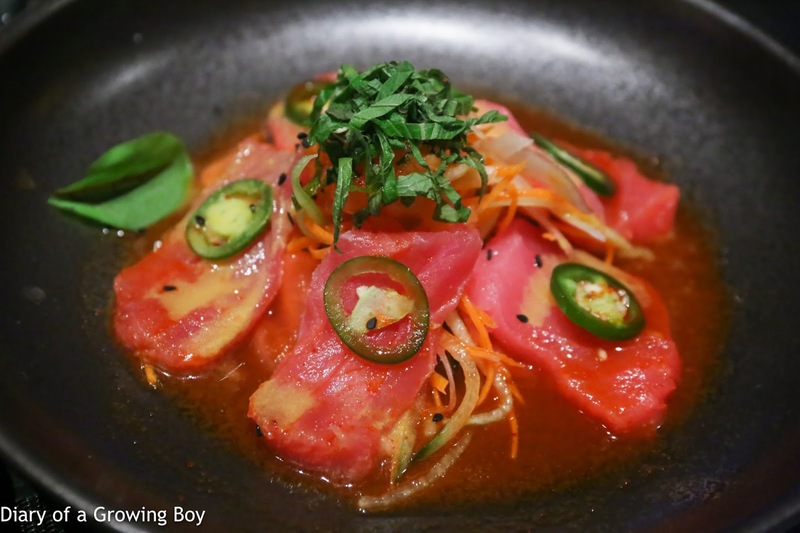 Loved the diced cubes of ham inside, and of course the kick from the kimchi was delish. Bulgogi marinated fillet steak - if there was any marinade, I certainly didn't taste much of it. We asked for medium doneness, but what came seemed more like medium-rare to me - not that it was a problem for me. 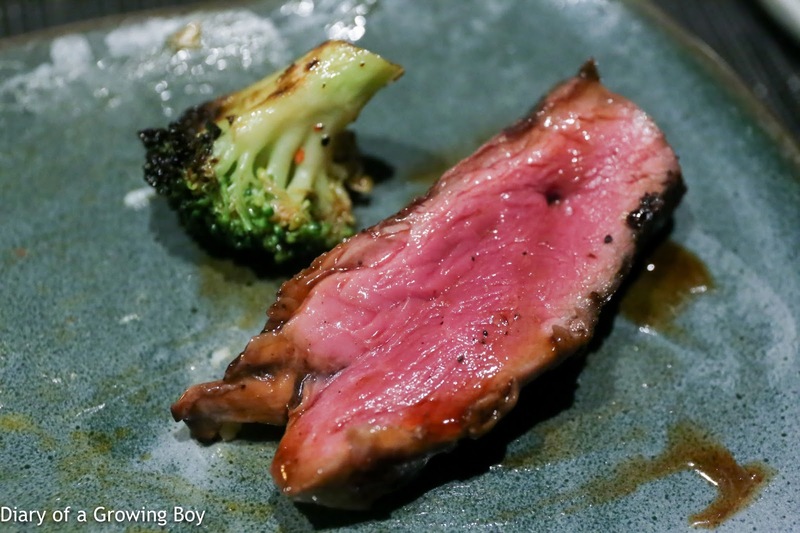 But as nice and tender and juicy as it was, this Australian beef was just bland. The meat itself didn't have much flavor at all, and really needed the soy glaze as well as the charring to have any taste. 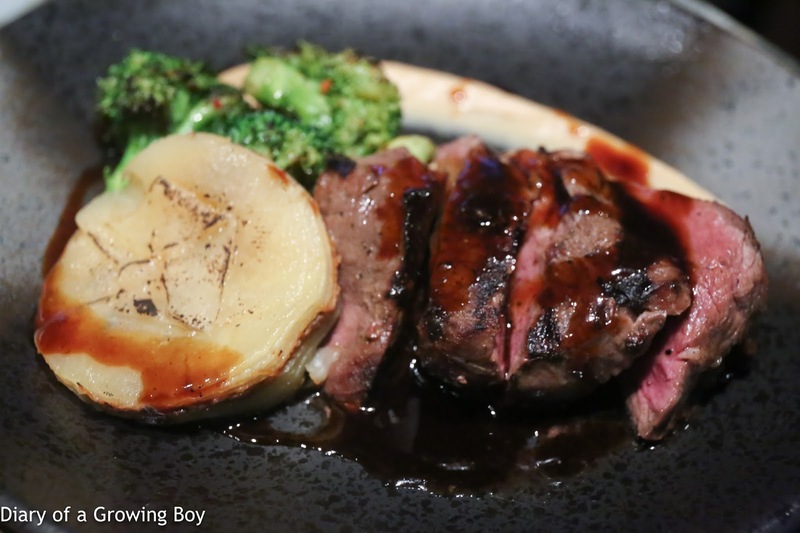 For a slight (~10%) premium, the basic bavette at Neighborhood is MUCH, much more tasty. Since the two of us went through TEN dishes, I was too full to have dessert, but Slim Donkey took advantage of his svelte figure by having something sweet to finish. The two of us had a lot of fun catching up tonight. The food was alright, and as Slim Donkey said, it felt like Korean food made for white people... the expat business crowd that filled up a large portion of the restaurant tonight. While a few dishes fell short of our expectations, it must be said that none of them were disastrous failures, and overall this was a pretty decent meal. Given how busy the restaurant was tonight, it was clear that lots of people enjoy dining here... or at the very least, are here to try out the food on account of Judy Joo's reputation. I guess I'll come back and check out some of the dishes that I didn't get to tonight.